This turtle pot holder in green, maroon, and purple might be for you. 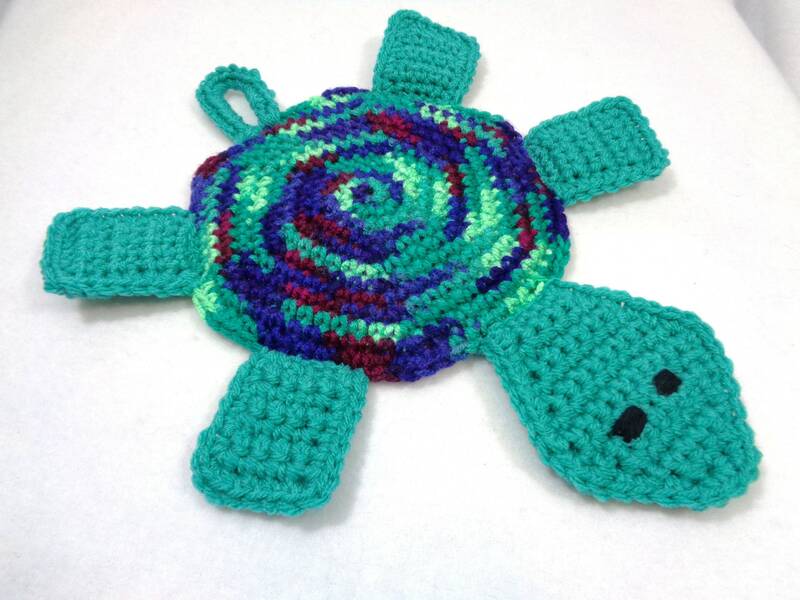 Crocheted with two layers of thickness, this little turtle is perfect for using in the kitchen to take those hot pans off the stove, or to have on the table to put something hot on. He doesn't mind the heat at all. He also would love to hang around and decorate your kitchen or bathroom. He is also useful sitting on a table looking cute! The center of the turtle is crocheted with a variegated yarn which includes two shades of green, purple and maroon. He has four green legs, a head with embroidered eyes, and a hanging loop for his tail. He measures 11 inches from his head to his bottom, not including his hanging loop. His body is 7 1/2 inches across, but he is 11 inches at his widest with his legs. He is machine washable and dryable. You know you just need to bring this little turtle to your home. He would make such a great hot pad to sit on your table to hold your hot pots! Or give him for a shower gift to someone who's getting married. Definitely a one of a kind gift. He would also make a great Christmas present for yourself or your favorite person! He is not intended to use with extremely hot temperatures.